Things were looking good at the one third mark. The scenery was quite beautiful. White sheep dotted the landscape like miniature fluffy clouds. The sun’s rays reflecting off of the silver domed silos caused our eyes to turn away. Like a never ending roller coaster, our car bopped up and down and around sharp corners. What a fun adventure we were having! Slowly, the black ink of nightfall overtook us. Unfamiliar roads that were once a joyous amusement park ride had now become a haunted house. Caution teased the speedometer from seventy down to sixty-five. Eyelids drooped like the jeans on a teenage hip hop wannabee. We were twelve hours in to our journey and we still had two hours to go. Are we ever going to get there? My desire to become like Jesus begs the same question. When I look at His life, I admire the way He loved. Few people will walk up to a leper and put their hands on them. Jesus did this without hesitation. He deeply loved the religious leaders in spite of the fact that they were plotting to kill Him. Incredibly, He restored Peter to the fold and gave him a position of leadership even though he denied knowing Him. My heart’s cry is to emulate Jesus and personify love. This is a challenging proposition. Recently, I had two incidents that revealed I have not arrived yet. The first was at work where I lost my patience with a client. The second was in a personal relationship where an old root resurfaced and I lost my cool. Thankfully, the grace of God covers me and I forgave myself. Our ability to love others flows directly out of our relationship with God. Quality time spent in His presence is like looking in a mirror. Before long, we begin to reflect the image that we gaze upon. Revelation of who God says we are is contained within the bible. As we pray the scriptures over ourselves and commit them to memory, our minds are renewed and He transforms us in to the sons and daughters we were predestined to become. Knowing who we are and loving ourselves gives us the ability to love others unconditionally. We are all sojourners here with our citizenship in heaven. Until Jesus returns or brings us home, we will never fully arrive. However, if we keep our eyes fixed on Him, the Master craftsman will continue to perfect us and help us to put on love. The question is, will you enjoy the ride or treat it like a haunted house? Excitement ran high for at least the first hour in anticipation for our destination. Then, after we’d played all the travel games in my mental library, their patience ran thin and inevitably they asked, “Are we there yet?” or “How much longer?” And our answer was always the same, “About an hour.” (The first time they asked that, we truly were one hour from our destination so it became our ‘pat answer’ and eventually our inside family joke). So there we were, stuck in the middle of NOW–our view muddled with fatigue and impatience for the road ahead–hanging onto the vision of our promised destination. On the forty-year road trip in the desert, Moses was stuck in NOW with God’s whiny, impatient children, relying only on God’s vision and provision. And when the people asked, “How much longer?” one too many times, Moses found himself at a crossroad. He could obey God and bring forth the water by speaking it forth or He could strike out in anger and disobedience, give-in to his own impatience and lose ground. He chose the latter and never crossed over to the Promised Land (See Numbers 20:1-8). Yet, God in his faithfulness, did fulfill his promise and brought his people into the Promised Land, filled with milk and honey. It’s like that between us and God, too, isn’t it? He drops a vision into our imaginations and we’re over-joyed, excited, giddy.We pack our bags full of hope and dreams and hit the road running stock-piled with bubbling energy. And sometimes, stuck in the NOW between home and God’s vision we lose steam, grow impatient. We ask, “How much longer, God?” And if we’re honest, we doubt–doubt the vision was God-given or if we’re cut out for it at all. We grow impatient–dare I say angry–with God in the midst of our trip. When we find ourselves stuck in the NOW, all out of steam we’re at a crossroad. We can choose disobedience–turn back home carrying only a dream of the vision–or forge ahead toward the reality of the vision. Our journey may take us more than an hour, a day, a month, a year, but on-the-road is where God forms our character–prepares us for our destination. Some of our best family memories were not found upon reaching our destinations but on-the-road in the conversations, places and people we experienced getting there. Where are you on God’s journey? Thank you for setting your vision on our hearts and allowing us to participate in your dreams. 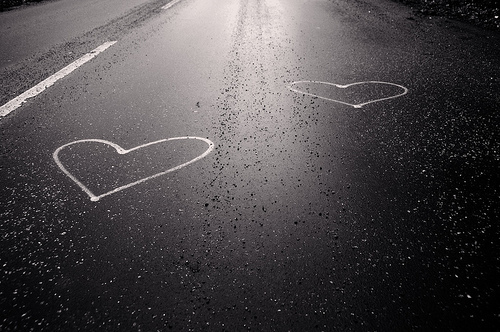 Strengthen us for the journey and prepare our hearts to follow you no matter how long. And when we grow weary, impatient or doubtful, remind us of your faithfulness. Please visit our Contributors Page to learn more about Dawn. 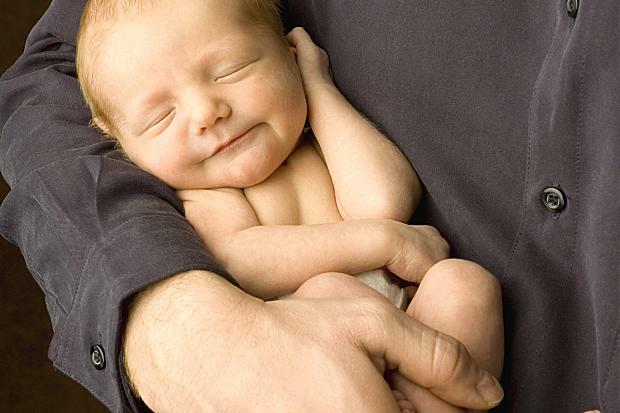 A dad held his infant and said to him, “You, my little son, will be called the prophet of the Most High, because you will prepare the way for the Lord. You will tell his people how to find salvation through forgiveness of their sins,” (Luke 1:76-77). John the Baptist was this new-born baby, unaware of the call over his life and the anticipation heaven had over him. Yet, God didn’t wait until he was a strong man before He proclaimed His word over him. There is a reason why God proclaims His word over us when we are very small–no matter what the call is, it will not be fulfilled by our strength and power. It’s not our size that will fulfill the call, rather it’s the weight and strength of the word of God over our lives that will propel us into our callings. We all carry a unique call from heaven. This is stronger than physical, financial, emotional and mental limitations. It’s the Word from heaven in our lives that propels us past these limitations. As a weak, helpless babe John carried a weighty call. The call was stronger than his frail mind and body. The dream God has for us is always much bigger than our ability because God has designed us to function in partnership with Him. The dream of God over your life is meant for two to fulfill. If we were supposed to do it on our own He would have given us a call in proportion to our size, but He never does. The call on our lives is huge and impossible in comparison with our size, because it can only be fulfilled by a small person living in agreement with Almighty God. You see, when John was too small to comprehend it all he was surrounded by people who believed what God had said to him. It’s vital that we, like John surround ourselves with earthly agreement. The people who you share your life with are directly linked to your future. Baby John possessed nothing but a word from heaven. The dream of God often starts with nothing more than a crumb in our hands, a stirring inside. It’s important that we honor what God stirs in us by nurturing it. Agree with it– When you agree with what God has said, you position yourself as God’s partner. Intentionally surround yourself with those who will together agree with God’s dream for your life. Submit to it– True submission to God’s dream for our lives takes time. It involves us letting go of personal limitations that were shaped by fear and other junk. God’s dream is always the most fulfilling way for us to live. We were made for this! Release it– It’s scary to step into His call because we feel as if we only have a crumb to give, but when we release the crumb that’s in our hands it becomes a loaf of bread that others will feed on. We release the crumb – God gives it life. I don’t typically go in for Gematria or other numerologies. I prefer the harder sciences, like prayer, which anyone seeking a direct and urgent answer from the Lord will tell you is exceptionally hard. But in this instance the numbers could be neither avoided nor ignored. There is no better way to doom oneself to a predawn morning of endless tossing than to glance at the clock when inexplicably awaking in the middle of the night. I made the awful mistake a few hours after midnight in late April. 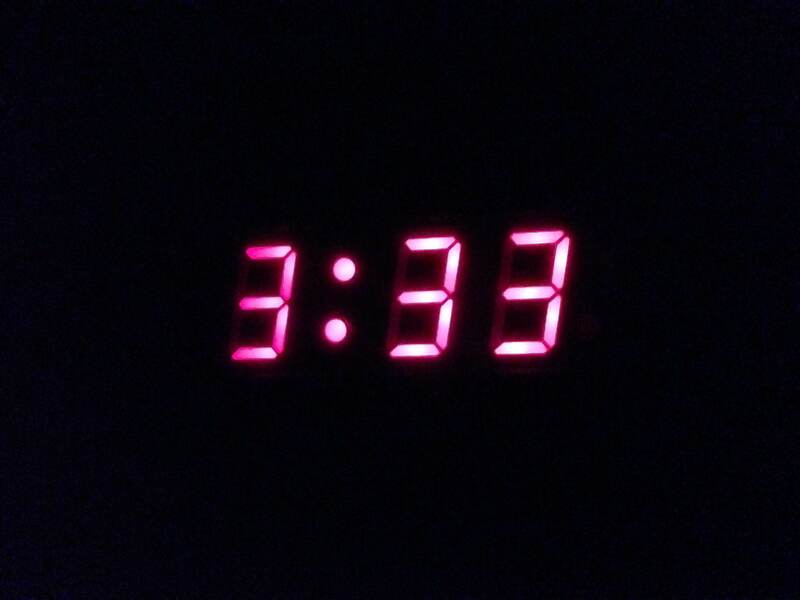 Three fiery threes seared my eyes from across the bedroom. I should have dismissed them. Normally, I would have. Yet in that dark hour a miracle occurred: my groggy soul took notice. The spirit is willing, they say, but the flesh–oh God, the flesh! I meant to ask someone more practiced in divine numbers about the triplicate threes, but alas! I’ve yet to reach my glorified state. I will, however, claim this small achievement to my credit, if you’ll allow it. I suspected something was up. To the credit of the Lord’s great mercy and to the great relief of my spirit, the nocturnal illumination, like my own personal Aurora Borealis on the nightstand, repeated itself precisely one square month later. May was winding to a close and 3:33 again made its presence felt to me. Somehow I knew this was no unholy haunting. How could it be–a trinity of trinities. God was in those neon digits. Equal parts spooked and excited, I sought the advice of my colleague, who is better versed in some of the Lord’s more curious modes of speech. “What’s the deal with threes?” I asked him. “Fulfillment,” he replied. “Resurrection!” His response sent a charge through my bones. It’s far too long a tale to tell here, and it’s probably far too personal a story to share on the internet, but I had long been awaiting a kind of new birth of my own. In the 1950’s, scientists Stanley Miller and Harold Urey filled a glass apparatus with gases thought to have been swirling about the earth’s primordial atmosphere. Into this tiny chamber they injected a catalyst of electrical current, miniature lightning through a miniature atmosphere. The product of their experiment was a rich blend of amino acids, complex molecules that are the building blocks of simple life forms. The ingredients to my own primordial soup: the love of my life, a broken heart, divine promises, countless prayers, and six years of solitude. My alarm clock was no longer a simple timepiece. It was the probe that supplied the electrical catalyst into my gaseous hopes. This digital clock radio, a gift to take to college nearly twenty years ago, had announced a different kind of time. The arrival of my dreams, it declared in its own curious language, was near. It was not yet fulfillment, but it was a life, of sorts. I spent the following weeks and months in a state of constant anticipation. Surely, I thought as I checked my mailbox each evening, she’s written. “It’s her!” I exclaimed with each successive ding of my phone. She hadn’t and it wasn’t (not yet), but I was suspended on a wave of expectation. I had new life, or at least the building blocks of life. All this is to say that the Lord was very gracious to me. Nearing the end of this lengthy journey, he could have left me to limp or crawl across the finish line. I could have been blindsided with a joyful conclusion. Instead, he dispatched a flurry of threes to intercept my sleepy spirit and had me bounding towards the fulfillment of his promises with courage and confidence, even if I still prefer not to look at the clock in the middle of the night. Please visit our Contributors Page to learn more about Mike.